Before surgery, I ate constantly and it was never healthy. My food choices didn’t make me feel good. I ate to fill a void where confidence should have been. Going up a flight of stairs was near impossible. I never wanted to do anything with my kids. Swim suits... forget it. I was a hermit. I was embarrassed to go in public. 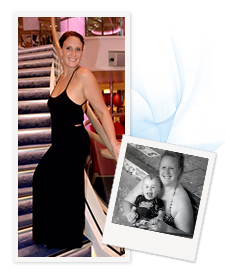 I was scared about all of the health risks that I would be facing if I didn’t make a huge change soon. I know the exact day that I decided to reclaim my health. It was the day my son signed up for soccer. I quickly realized that I couldn’t teach him how to play, because I couldn’t catch my breath. I was embarrassed, sad, and scared for my future—my family’s future. It flipped a switch in me. I wanted to be healthy, to set a good example for my son and daughter, to show them that anything is possible and that being healthy is fun! I set up my consultation and met with my surgeon. He went over all of the available options and the pros and cons of each procedure in a group presentation. Then he met with just my husband and me. He asked about my goals and what I wanted from the surgery. He listened to our fears and answered our questions. Then he went over what he thought would work best for me; my lifestyle and the goals he had for me. From step one of this amazing journey, everyone has treated me with so much respect. The whole team is very knowledgeable, understanding, caring, and friendly. All of my post-op visits felt like a party celebrating my success! Every single Barix Clinics staff member was my cheerleader. They helped me, motivated me, and kept me going! I feel like I’m living a brand new life! I am a new person, new wife, new mom, and new friend. Each day is an adventure doing things I never thought I would do! I play soccer with my kids, ride horses again, and wear swim suits with confidence. I have even been zip lining! I am able to be so much more active and I feel amazing! Do it! The only single regret I have about surgery was waiting, hesitating, and not doing it sooner! It’s not always easy, but it is always worth it! Your health is so important and this is a huge opportunity to take charge!